Providing you the best range of milk cereal based complementary food for infants with effective & timely delivery. We are the manufacturer of Baby Food (Infant Food) From Age 6 Months. We are BIS (Berue of Indian Standards) approved facility for Infant Food Manufacturing. The Brand "GrainyLac" is woned by Scientific Brain Nutrceutical Pvt. Ltd.
At birth, mothers milk remains a baby’s main source of nutritious food. But when the baby starts eating solid foods, you would want to consider the best healthy baby food. With GrainylacTM you can feel sure safe and secure as we are the best healthy baby food brand to serve your child. From the stage of infancy to a growing child, a baby’s digestive system is not yet fully developed and the food that you provide your child must contain all the energy and nutrition necessary for a healthy growth. Being one of the best healthy baby food manufacturers, our product GrainylacTM provides rich nutrition and high energy which satisfies your baby’s tender digestive system, ensuring comfort and provides maximum nutrition and growth. Rest assured, GrainylacTM commits to deliver your child nothing but the best. Scientific Brain Nutraceutical (SBN) products have a wide range of delights which serves your baby’s taste buds and tiny tummies. 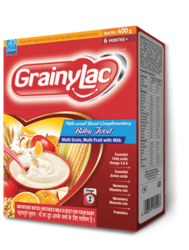 Every pack of GrainylacTM is a wholesome combination of multi grain (Wheat, Barley, Corn and Rice), milk and multi fruits (Apple, Strawberry, Orange, Banana and Mango) with the required fortification of vitamins and minerals. Enjoy! Looking for Baby Food ?